Managing a PPC account can be overwhelming. VERY overwhelming. There are so many levers and switches that can be adjusted in your account, many of which can have their own articles written about exclusively on their optimization. Buckle up as we dive in to the various different ways you can make the best of your PPC marketing budget. On the surface, keywords should not be too difficult; you enter what you think people who would be potentially interested in your product or service would search for, and like magic, watch the dollars come rolling in. However, your competitors are also in the same space and want to get as much of those “easy dollars” as you do. If your business sells a product that is pretty common or essential, (i.e.running shoes), a general term is going to bring up many matches. 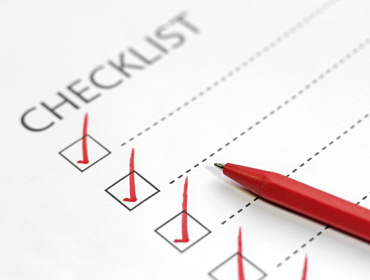 This means that your competitors intend to use the same keywords you are planning for as well. This is where the importance of keyword research comes into play. The very general keywords that describe your industry will be highly sought after and will generally have a very high average CPC (cost per click). As a result, many digital marketers like to use long-tail keywords that are more specific and tend to have less competition, and thus lower CPC. This works well with how users generally use search engines: they are there to find an answer to something, and many will literally type in a question or a long line request. These are precisely the opportunities for cheap long-tail keywords we are looking for. Since they are asking specifically for these requests, these long-tail keywords tend to bring in more qualified leads for your business. To perform keyword research, you can use various keyword planning tools available, including the Google Keyword Planner, which gives you new ideas for keywords or ad group, as well as analytics on average CPC, search volume and level of competition. Another excellent tool to use is Google Trends, which tells you what topics are currently trending on a certain topic. Although long-tail keywords are good opportunities to use, we also do not want too many. Having too many long-tail keywords means that you have many very specific keywords can lead to very disparate ad groups. This will lead to negative results to your Quality Score, thus requiring you to bid higher than you should have to. The right answer is the find BALANCE between using long-tailed keywords and more broad terms. For your industry, there may be long-tailed keywords that would be a huge boon for you to include, but there may be others that are extremely niche and only experts of your industry would actually search for these. Not only do they potentially pose a risk to your Quality Score, but having a large list of long-tailed keywords makes your campaigns difficult to manage, and it is difficult to discern which are performing and which aren’t in the large sea of keywords you have created. In cases like these, as an expert in your industry, you need to exercise discretion as to which are essential to your business. You can also use keyword analytic reports to see which of your long-tail keywords are actually performing to aid you in your decision on which long-tail keywords to retain or remove from your ad groups. Although more general keywords may be expensive, they give you an opportunity to perform keyword discovery. While your campaigns are running, it is wise to go over your keywords reports to see what search queries your keywords are ranking and being clicked for. These give you ideas for more qualified long-tailed keywords that are actually being searched for. TIP: The use of branded keywords and value propositions words are very valuable to your keyword selection. These types of keywords indicate that your customer is close to the end of the buyer’s journey as they already have some idea of what they are looking for and are interested in buying. These should also be considered for your ad copy to entice users to click and convert. With your business, there is bound to be some portion of your customer base that contributes more to it than others. A key part to your success is to know who are your most important customers and to market towards them more aggressively. You can segment in many ways such as geographical location, language, day-parting as well as operating system. When you segment your customers, you can make separate ad groups or campaigns specific to each subgroup of customers so you make the best use of your dollars. You’ve created your list of keywords, but how strong of a match matters to your keyword matters as well. For reference, let’s take a look at some of the matching options that are available. 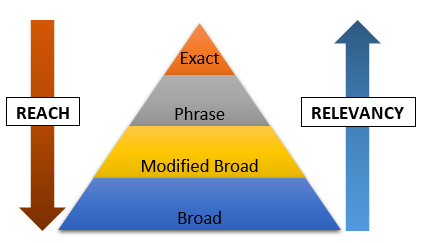 Broad Match: Matches your keyword with search queries that contain parts of your keyword, synonyms, variations and related searches, in any order. This is a very generic match, and while your keywords may match a very relevant search query, the odds are that most of the time, they will not be specific to your business niche. Because they are so generic, many people are bidding for the same keywords, and this tends to drive up the CPC significantly. Broad Match Modifier: Adding a “+” symbol in front of a part of your keyword will ensure that only those search queries that include that word or a close variation of it will be included. Any part of the keyword with the symbol included have to be a part of the search query. This refines your broad search significantly, by making key parts of your keyword be included, while still casting a wide net to capture a wide variety of different combination of words that Phrase Match would not be able to do. However, this modifier only works on keywords set to Broad Match. Phrase Match: By adding quotations around your keyword, your keyword will only appear for search queries that contain your exact keyword phrase or close variations, in the same exact order, with nothing in between the individual words. This is important if your keyword is for specific industry terms or contain fairly common words, but only make sense for your business or industry in the particular order you have listed. Otherwise, your keyword will match for less relevant searches, despite containing the same or similar words, wasting your clicks. Exact Match: With Exact Match, only searches that are exactly the same or are close variations of the keyword will be a match and display your ad. This is helpful for specific search queries that are commonly asked, as ensures we match only for exactly what we are looking for. This is particularly useful to reach users who are near the end of the buyer’s journey. To only appear for Exact Match, your keyword must be surrounded by brackets. Negative Match: Often when adding keywords with a certain match, there are certain search queries with words you do not want to match for. This is for cases where one of your words is a common term with another word associated with it that is irrelevant to your business or industry. Examples of these can be words like the name of your competitor, or the name of a product or service completely unrelated to yours but are used in common lexicon. In cases like these, it is wise to add a negative match, which filters out the matches that include the negative keyword(s). Generally speaking, as your match types become more specific, the average price of the CPC will go down, as there is less potential competition over the particular keyword. However, a broader search is still useful if you want to continue keyword discovery, or if you want to cover all your bases in case you miss niches. However, with these broad searches, it is highly advised to have lower CPC bids than Phrase or Exact matches, as otherwise, this will quickly use up your budget. One strategy is to have multiple match types for the same keywords, known as a stacked bidding strategy.What this allows is for you to benefit from the lower prices from more specific matches, while still capturing search queries that you may have overlooked. Since they are identical keywords, your matches for more specific searches will be within the set of potential matches in the more broad searches. However, as stated, more broad searches tend to be more expensive, so to benefit from this strategy, the bids for more specific matches must be higher. With a higher bid on the more specific matches, Google will take that as the higher bid when both the broader match and the more specific match are triggered by the search query. Since the actual CPC for the more specific match will be lower than for the broad match, you will get the better pricing each time, even though you bid a higher max CPC. When developing your PPC campaign, the amount you allocate is determined by how much you would normally invest for marketing and sales. This is known as your maximum bid. By definition, this is the most you can afford to invest in your campaign, based on the expected performance, in order to make a return or break even on our investment. In order to properly calculate this amount, you need to know what the final action is worth to your business, as well as the rate of conversion. One other factor to consider is what your customer lifetime value is; this is the amount of value your customer holds with your business over the course of their lifetime once they have encountered it, as opposed to one-time transactions. The more your customer repeatedly purchases from you, the more you can afford into the PPC campaign to attract them. With the higher CPC, your ad is significantly more likely to rank high in search engine result pages. 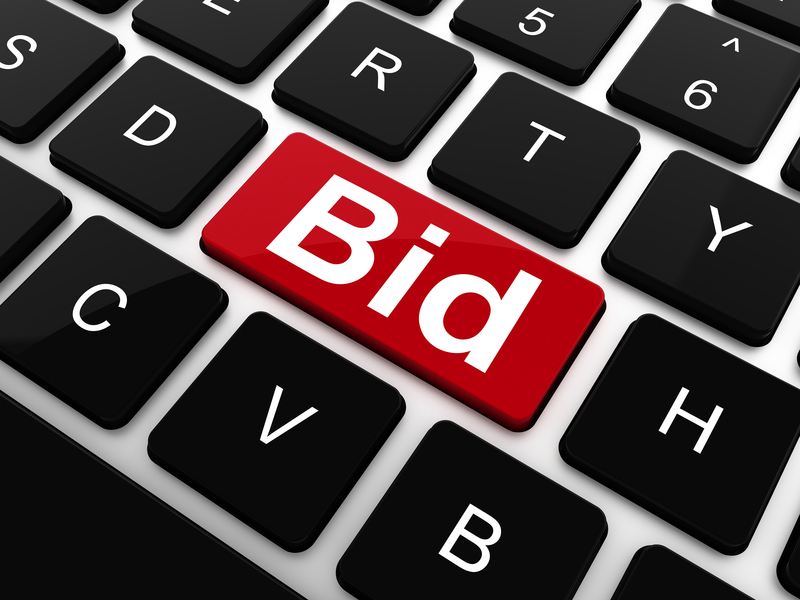 There are numerous options to decide how much you will bid for each of your keywords. By default, your keywords are set to manual bidding. This gives you a high level of control, as you can analyze the performance of your keywords and adjust bidding on them according to your campaign objectives. You can also make use of the bid simulator, which provides scenarios of keyword match results based on certain bid changes. The Opportunities tab is another source which lets you know the estimated bids for first page rankings and the possible keywords to increase bids and get a larger share of traffic. Over time, as you gain insight from your campaigns, you can add bid modifiers to your keywords or your ad groups based on the traffic details of your clicks. This adjusts the bid by a percentage depending on the time of day, day of the week, location and/or the device. This allows you to bid higher or lower depending on what context is more/less successful towards your campaign objectives. If there is a certain time of day or a certain location where there are more qualified clicks that are coming in, it makes sense to bid more aggressively in order to reach more of that high quality traffic, while the reverse is true for poor context that brings in traffic less likely to convert and wastes our clicks. While there is a lot of control with manual bidding, there are many merits to automatic bidding as well. Rather than set individual bids for your keywords or your ad groups, you merely set a daily budget and AdWords will automatically adjust the bids in order to reach the most possible clicks for your keywords. This is useful for accounts that start off with limited conversion data. One drawback is the clicks are primarily cheap clicks in order to maximize quantity; they are very likely to be lower quality matches that are less likely to convert. However, automatic bidding does provide you with a wealth of initial data to provide insight which you can later use to perform modifications to your bidding strategies. In order to better understand this data, it is a good idea to utilize conversion tracking on your landing pages in order to understand which keywords are best performing for you. As your campaigns run over time, trends will appear and you can take advantage of them more automatic. To do so, we can use Enhanced cost-per-click (ECPC). In this setting, AdWords takes into account past results of your keywords and raises or lowers your max bid by up to 30%. With ECPC, your campaigns pay more attention to more quality search queries and less to those of low quality. Like any smart business-minded person, you want to invest more in potential customers who are more likely to buy than those who just happen to be strolling by. You are able to apply flexible bidding strategies at either the keyword, ad group or the campaign level. While you still retain the manual control over the majority of your keywords, ad groups and/or campaigns, the search engine uses objectives to automatically bid for a subset of your keywords, ad groups or campaigns. Once you’ve preset the bidding strategy, you can apply it regardless of account structure. This is great in cases where you want to micromanage a small subset such as a keyword that you suspect can be performing better or need its own budgets, etc. In cases like that, you can employ a peel and stick method, in which you remove the keyword or ad group and create a separate ad group or campaign with their own bids or structure respectively. 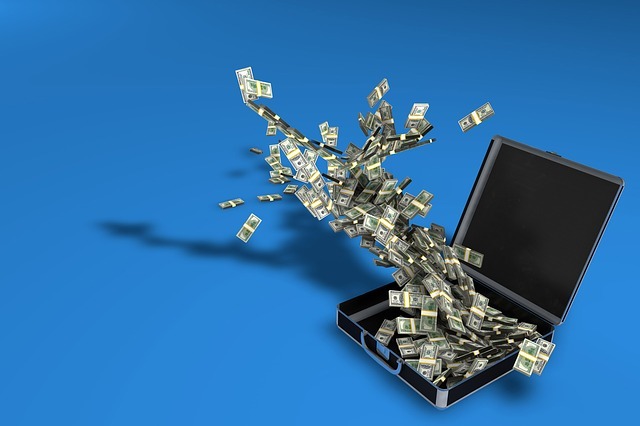 Basically, these flexible bidding strategies allows you the convenience of optimizing small parts of your account and determine what further action can be taken, if any. As you can see, there are many factors to a PPC account that can be adjusted to optimize for the best results. Many of the features listed will overlap or work in conjunction with another, but the main point is to find cheap opportunities, ensuring you maintain a high level of quality, and investing as much as possible into the most useful clicks. Managing your PPC account is an iterative process involving analysis of your selections and adjusting the different possible levers. As you adjust these different levers, it is important that you analyze the changes that you make and take note of what works, what doesn’t, and plan for next steps. Don’t let your competitors leave you behind, have a Free 25 minute marketing assessment with us TODAY.